The Raiders hosted free agent defensive end Cassius Marsh earlier this week, according to Vic Tafur of The Athletic (Twitter link). Marsh was released by the 49ers last week after spending parts of two seasons in the Bay Area. San Francisco originally claimed Marsh off waivers in November 2017 and signed him to an extension the following April. 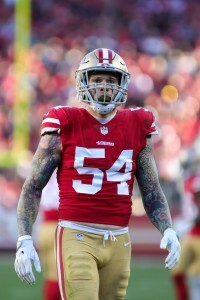 The Niners had just exercised Marsh’s option for the 2018 season earlier this month, but the club didn’t have a need for him after acquiring fellow defensive end Dee Ford from the Chiefs. Now entering his age-27 campaign, Marsh played a career-high 550 defensive snaps in 2018, racking up 38 tackles (seven for loss) and 5.5 sacks in the process. He also saw action on roughly 50% of the 49ers’ special teams plays a year ago, and has nearly reached the 80% ST threshold in prior seasons. Special teams would likely be an area of focus for Marsh if he signs with Oakland (especially after the team ranked just 22nd in Football Outsiders ST ratings), but the Raiders need help on the edge, too. Oakland posted only 13 sacks in 2018, the fewest of any team in more than a decade.